The Suzuki Vitara pioneered the small SUV market when it first on sale in Australia in 1988. The Vitara nameplate hasn’t been seen on a new car for 15 years since it was last on sale and Suzuki have revived the name to help propel the company up the sales chart. The Suzuki Vitara is available in two model grades with the entry-level 2wd RT-S available with either a six-speed manual or auto transmission, the range topping 4x4 RT-X is matched exclusively to the six speed auto. Suzuki first debuted the Suzuki Vitara at the 2014 Paris Motor Show where it received glowing praise from European press. The entry level Suzuki Vitara RT-S comes with sat-nav, & airbags, cruise control, Bluetooth, 17” alloy wheels, daytime running lights and 7 airbags as standard. The range topping RT-X adds keyless entry, push button start, 4x4, polished alloy wheels, sunroof, LED headlights, Auto lights and wipers, digital climate control and leather seats with suede inserts. Suzuki is offering a launch drive away special for the 2015 Suzuki Vitara RT-S priced at $22,990 (6-speed Manual) or $24,990 (6-Speed auto). Suzuki Vitara key specifications by model can be found here. A single 1.6 litre petrol engine that produces 88kW @ 6000rpm and 156Nm @ 4,400rpm is the only option on the 2015 Suzuki Vitara range. The entryl level RT-S is available in front wheel drive with either a 6-speed manual or 6-speed automatic transmission. Claimed fuel consumption figures in the manual 2WD RT-S variant is 5.8L for the 2WD manual. And has a claimed fuel consumption figure of 6.3 litres per 100km. Europe gets the diesel power plant that currently isn’t available in Australia. The Australian arm of Suzuki is in discussions with HQ about bringing the diesel engine to Australia, however there is no confirmed date for the diesels arrival. The interior of the 2015 Suzuki Vitara delivers a well thought out and clean design. The instrument panel is clear and easy to read and the 7” multimedia touch screen is simple to use. The touch screen hosts the standard reversing camera and sat-nav. We also believe that the head unit is upgradable to Apple Car Play and Android Auto once the Silicon Valley companies sign-off on the integration. Spending sometime inside the interior you will notice that the plastics used on the door and dash are a little on the cheap side. The leather and suede seats on the RT-X are supportive and offered a comfortable place to be on our launch drive. For owners looking for a little individual styling they can add colour coded interior trim to match the exterior paint colour. Suzuki Australia expect the option to cost around $300 fitted. Rear seats are adequate with plenty of legroom and headroom for adults, you could comfortably fit two adults in the rear, three would be a little tight. The luggage capacity the 2015 Suzuki Vitara measures in at 375-litres with the 60/40 rear seats in place increasing to 1,120 litres with the rear seats folded. Weighing at just 1,075kg and matched to the spritely 1.6-litre petrol engine the Suzuki Vitara is just at home on the freeway as it is in the city. In start stop traffic the nimble Suzuki Vitara is a pleasure to drive. The 6-speed automatic transmission performs smoothly and matched to the 1.6-litre engine feels quite zippy. Sitting at 100km/h on the freeway engine revved at 1950rpm for most of the journey, it was only when the engine changed down to tackle a hill that we noticed any additional noise in the cabin. Surprisingly the high-riding Vitara backs up its zippy performance with nimble and engaging handling. The steering is a little light yet offers plenty of feel, and the Vitara hooks in to high speed corners with surprising agility. The range topping Vitara RT-X comes with Suzuki ALLGRIP 4WD technology which allows the drive to select the transmission mode from Auto, Sport, Snow and Lock. Suzuki ALLGRIP 4WD technology changes where the power is sent, from fuel-saving 2wd mode cruising in Auto, to permanent four-wheel drive for when you find your self a little further of the beaten track. Sport changes throttle response and sends power to the rear wheels. The Vitara is great little SUV but the use of cheap plastics on the dash and doors let it down. Also some rear vents for the passengers in the back wouldn’t hurt. 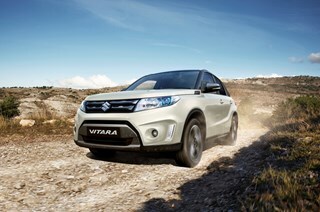 The Suzuki Vitara stands alone at the moment as a small SUV that can over real 4x4 capabilities. Until the Jeep Renegade lands downunder from late October 2015 the Suzuki Vitara sits at the top of the offerings. The 1.6-litre engine offered great fuel economy even in peak hour out of Melbourne on the Monash freeway down to the Mornington Peninsula. If you are looking for a small SUV that needs to go a little further off the beaten track then the Vitara will suit your needs. The ‘drive away’ pricing offer will be around for sometime so make sure you factor that in when comparing the Vitara to other models on your shopping list. If you are looking to buy in the small SUV segment the world is your oyster. Honda HR-V: From $24,990. Great little SUV but doesn’t offer the off-road abilities like Vitara. It’s well priced and the magic seats are great. Peugeot 2008: From $21,990. European flare and a serious contender in the small SUV market. Does offer a diesel among its four-model line-up. Nissan QASHQAI: From $25,850. Top city car with optional diesel but no AWD offering. Skoda Yeti: From $23,490. Offers decent AWD ability and has great cabin flexibility like the HR-V.
Mazda CX-3: From $19,990 offers quality interior and excellent styling. Rear cabin cramped and lacks standard reversing camera.